Project Icon, the long-awaited replacement for the 61-year-old traditional Land Rover, is under secret development inside JLR’s Gaydon design centre and earmarked for a 2012 launch. The new Land Rover is a relatively simple, steel-suspended workhorse intended also to attract lower-end Discovery buyers. It should hit the market soon after Land Rover’s existing iconic model, the Defender, reaches the end of the road, killed by legislation, and will reach most of the current Defender's 160-odd export markets. The new Project Icon workhorse is based on the tough, capable but relatively heavy T5 steel platform chassis used for the existing Discovery and Range Rover Sport models, both of which are due to be replaced beyond 2012 by aluminium-based models which are between 400kg and 500kg lighter. Land Rover wants to retain a simple, twin-rail T5 chassis because allows them to continue offering the variety of body styles — hard and soft tops, truck and crew-cab versions – from which Defender buyers can now choose. The T5 chassis supports a modern all-independent suspension available both with steel and air springs. It is well-known for its sturdiness, but will need its own weight-reduction campaign. The model will be made in the UK at first, but JLR bosses believe it could soon be made from KD (Knocked Down) kits in big markets like China, Russia and India. There are no details yet of Project Icon’s engines, but a big four-cylinder turbodiesel like the Freelander’s Ford-PSA 2.2-litre four, or the base Discovery’s 2.7 litre V6 turbodiesel make likely candidates. comunque l'idea non mi spiace. L'articolo molto molto probabilmente si, i renders non penso. Sarà basato sulla piattaforma T5, già utilizzata da LandRover Freelander IV e Range Rover Sport. Propulsori - ipotetici - saranno il 2.7 V6 Biturbo diesel ed il V8 5.0 litri preso in "prestito" da Jaguar. Certo è che, se potessi, mi accatterei immediatamente un Defender 90 bello kittato come piace a me (piastre in acciaio su cofano e fiancate, portapacchi da deserto, faretti supplementari ed altri ammennicoli). Spero la ritocchino non poco, così mi pare l'Hummer di Topolino! 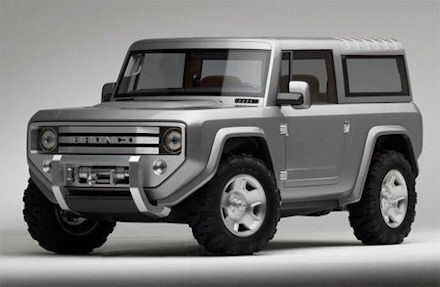 è un psd su base ford bronco di qualche anno fa..
Land Rover has finally begun work on replacing the iconic Defender, a project that insiders describe as the most ambitious ever undertaken by the British car maker. Last week John Edwards, Land Rover’s new global brand director, said the company was “serious about replacing the Defender” and revealed that the first results of the project “would be seen in the next two to three years”. Autocar can reveal that the new project will involve a huge investment by Tata, Indian-based owner of Land Rover. As well as a brand new platform and factory space, a wide range of body styles is expected to include station wagons and pick-ups, as well as bespoke specials for commercial customers. The first of the new models is expected to roll off the production line by mid-2015. It’s thought that Land Rover is at work on the strategy stage of the Defender project, with the engineering, design and marketing divisions deciding the number and type of variants, and the likely sales volumes. 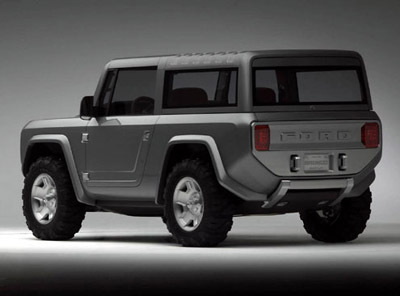 Autocar understands that once a firm plan is established for the new Defender, a concept will be readied for early 2013. Although Land Rover sold just over 18,000 Defenders last year, it still feels that the vehicle defines the company. The decision to make a huge investment in a traditional Land Rover is based on a huge market research programme that has divided the global SUV into three segments: luxury, leisure and utility. The global utility SUV segment is good for 3.25 million sales annually, a figure that’s set to grow by 25 per cent by 2017. By contrast, the global luxury SUV segment is currently good for two million sales and set to grow by 35 per cent by 2017. The leisure sector accounted for around eight million units last year. The company believes it can no longer have a tiny share of the utility market that it partly defined, even though it will be hard to re-establish Land Rover in Africa and Australia, where Toyota’s Land Cruiser is the benchmark off-roader. Iniziato il progetto per la futura Defender che vedrà 3 versioni (Passo Corto, Passo Lungo e Pick-Up). Concept previsto per il 2013 e lancio per il 2015. Sembra che l'attuale generazione della RR guadagni una versione a tre porte, una sorta di ritorno alle origini. Nuova "limited edition" di 150 pezzi della vecchia Defender con motore V8 da 5.0 litri per il 70-simo compleanno. Il 5.0 V8 eroga 405 CV e 515 Nm, accoppiato con l'automatico ad 8 rapporti di ZF. Lo scatto da 0 a 60 mph impiega 5.6 secondi e raggiunge una velocità massima di 171 km/h. Ovviamente con il nuovo motore, anche lo chassis è stato aggiornato con nuovi sistemi sospensivi, nuovo impianto frenante e nuove barre anti-rollio. Le "scarpine" sono dei cerchi da 18" con pneumatici All-Terrain. È offerto in otto tinte esterne differenti, di cui due satinate ed una particolare con tetto, archi passaruota e griglia nera a contrasto. Maniglie porta esterne ricavate dal pieno in alluminio e stessa lavorazione per il tappo carburante. All'interno sedili RECARO con pelle su plancia, pannelli porta e tetto. Inoltre abbiamo un nuovo sistema di navigazione-radio molto compatto. 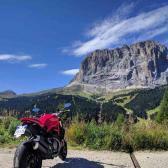 Sarà disponibile nelle varianti 90 (passo corto) e 110 (passo lungo).